It's the ideal go-to reference for the clinical setting! 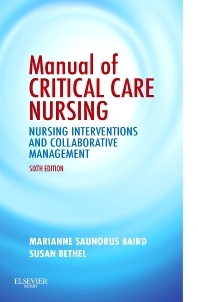 Compact and easy to use, Manual of Critical Care Nursing, 6th Edition presents essential information on approximately 80 disorders and conditions, as well as concepts relevant to caring for all critically ill patients and functioning in the critical care environment. Award-winning clinical nurse specialists Marianne Baird and Sue Bethel separate the content first by body system and then by disorder, with each disorder including a brief description of pathophysiology, assessment, diagnostic testing, collaborative management, nursing diagnoses, desired outcomes, nursing interventions, and patient teaching and rehabilitation. A concise format presents the material in a way that reflects a practicing nurse's thought processes. Continuous Renal Replacement Therapies NEW! Hyperglycemia, Ketoacidosis, and Hyperosmolar Syndrome NEW!